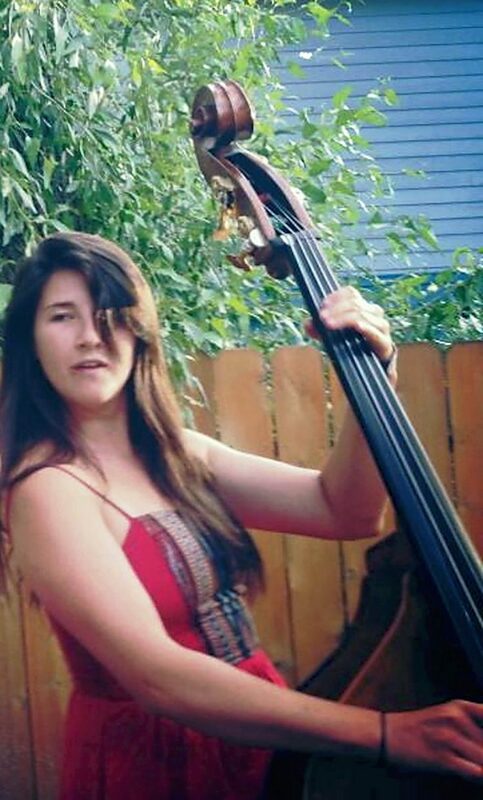 Carbondale stand-up bassist Natalie Spears will perform an original poem and an old-time banjo tune during today's L.I.T. Crawl to commence the Garfield County Libraries' Adult Summer Reading Program. CARBONDALE — Colorado songwriter Jim Hawkins loves sharing his western-themed stories — especially while playing his favorite instrument. “I am a storyteller hiding behind a guitar,” said Hawkins, of Glenwood Springs, who has lived in states around the West including Wyoming, Arizona, New Mexico and Texas. Today, Hawkins shares his western storytelling talents at an inaugural event to launch the Carbondale Branch Library’s summer literacy program. Starting at 4 p.m., the first L.I.T. (Literature in Town) Crawl features music, art and literature seen and heard on street corners throughout town. “June 6 should be an energized evening with Carbondale buzzing with events,” Hawkins said. When he’s not co-managing Four Mile Creek Bed and Breakfast with his wife, Sharill, Hawkins plays his signature western music at community events such as the Glenwood Downtown Market and Carbondale’s Dandelion Day. He formed the Ute City Rangers folk duo with musician and friend Fred Hamilton, producing a CD of original songs titled “Five Miles Up Four Mile Creek.” The pair has spent recent months producing the Storm King memorial music and video for the 20th anniversary of the deadly wildfire outside of Glenwood Springs. “I only play my original songs, which fall into the area of Americana or new western folk,” Hawkins said. A retired Denver firefighter, Hawkins plays today at the corner of Fourth Street and Colorado Avenue starting at 4 p.m. Poet Matt Roeser continues the entertaining at 4:30 p.m. Spoken word, poetry and music are being featured through 6 p.m. at several locations. An open mic follows at 6:30 p.m. at the library. “There’s a street dance, local musicians performing around town, new public art to view, an open mic at the library and more,” Hawkins said. The community-driven L.I.T. Crawl brings together more than 20 valley artists — including SoL Theater Company youth actors performing Shakespeare’s works — with new installations from the Carbondale Public Arts Commission’s Art aRound Town initiative. Hawkins said the valley’s host of creative enthusiasts is ideal for producing the first-time crawl to promote literacy and the arts. “The music scene in Carbondale and the Roaring Fork Valley has a great network of talented musicians, and events like this one are always supported by them,” he said. Along with Hawkins, musician Morgan Williams, bassist Natalie Spears, singer-songwriter and poet Terry Glasenapp and writer Trina Ortega are a few of the volunteer artists teaming with the library to launch the Adult Summer Reading Program. Williams and Spears are set to perform an original poem and an old-time banjo tune by Ola Belle Reed called “Undone in Sorrow” next to the sculpture at Third and Main streets. Pevec-Brown was inspired to help with the L.I.T. Crawl by Maura Masters, the library’s new Adult Services coordinator. The L.I.T. Crawl takes place through a collaboration with the Carbondale Chamber of Commerce/First Friday Committee, Carbondale Council on Arts and Humanities (CCAH), Carbondale Public Arts Commission, and the Aspen Writers’ Foundation. Masters said additional elements to the Adult Summer Reading program coincide with today’s L.I.T. Crawl. A fan of book clubs, Masters brainstormed the summer program and L.I.T. Crawl to advocate literacy for readers of all ages. Masters said the branch will host magicians for kids, a do-it-yourself dubstep class for teens, and classical music concerts for adults this summer. Valley artists, musicians, storytellers, poets and actors also sharing their talents in today’s L.I.T. Crawl include CCAH executive director Amy Kimberly, Cameron Scott, Claudia Putnam, Mabel Macdonald, Tim Brogdon, Karl Gunselman, Patrick Fagan, Werner Neff, Amelia Potvin, Carlos Herrera, Annie Flynn, Sue Schnitzer and Barbara Bush. Maps of the newly installed sculptures and artists performing next to them are available to the public at the library. Writers, poets, comics and musicians interested in participating in the open mic at 6:30 p.m. may sign up for a 5- to 10-minute set by emailing Pevec-Brown at apbrown@gmail.com and calling 618-0013, or by contacting the library at 963-2889.